It was first discovered by Spanish explorer Ponce de Leon in 1523, and settled by Pedro Menendez de Aviles in 1565 when he landed here with 7 ships. 1,500 men and colonists, planting the Spanish flag and a wooden cross signifying influence of Spain’s Catholic mission. His purpose was also defense and protection of strategic territory in the New World in the name of Spain. With this foothold, St. Augustine became America’s oldest permanently occupied European settlement. Although Florida was claimed by Spain, seafaring European nations were eager to take control over strategic territories. St. Augustine was one of these. Control of St. Augustine changed hands from one nation to another 4 times during its long history, creating cultural roots dramatically different those in the rest of America. From 1554 until 1763, it was claimed by the Spanish, who built thriving garrison community (First Spanish Period); Britain took over next, occupying it from 1763 until 1784 (British Period); Spain regained control again (Second Spanish Period) until 1821, when it was ceded to America by treaty following the Spanish American War. In the 1880s, a takeover of another kind took place. Through the foresight of Standard Oil executive and railroad magnate Henry Flagler, who saw sun-drenched Florida as a place of leisure for the wealthy, St. Augustine became a resort town. Today, the tours, museums, historic homes and sites are testaments to the 4 distinct cultural eras and to the Gilded Age influence of Henry Flagler. Constructed in 1695, in the scope of American history, this is a relic. 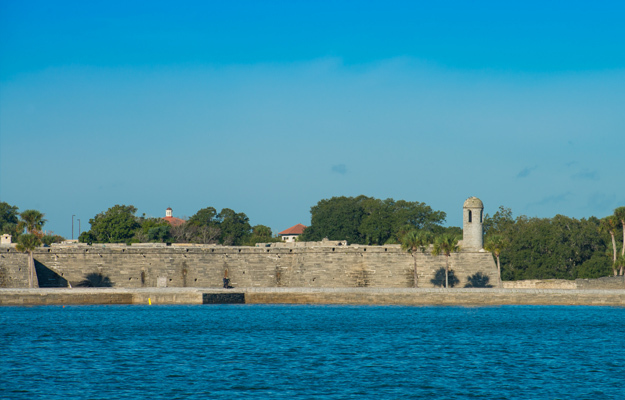 Made of coquina stone (local shell plus lime), it is the oldest masonry fort in the continental US. Built as Spain’s Bastion system of fortifications along the coast, its star-shaped design was built to withstand canon impact. Visitors can wander through the fort’s casements on a self-guided tour. Additionally, inside the the National Park Service historic site, the fort’s history is interpreted through videos, exhibits and ranger talks. At various times, re-enactors in period dress conduct weapon demonstrations. in the Florida Aquifer and has been channeled into a pipe for better viewing. Keep in mind that what we would call a fountain is not what Ponce de Leon would have found. He would have found precious fresh water bubbling up from the ground. The cool thing about the experience is being able to have a taste of water from the Fountain of Youth. It does taste different, like sulfur, which is what untreated Florida spring water tastes like! Throughout the park, there are a lot of other interesting things to see. Outdoor exhibits tell the story not only of the First Spanish Period, but also that of the native Timucuans who were living on the land when the Spaniards arrived. Theirs is an important story, told through historically correct full-size Timucuan structures in the Timucuan village, through artifacts integrated into the site, and in the Timucuan Burial Grounds. A reconstruction of the simple 1587 First Mission Church of Nombre de Dios provides insight into life in the Spanish settlement and the importance on Catholicism as a New World mission. A climb up the Spanish watchtower, a precursor of coastal lighthouses, leads to a great view over the marshes. A walk through the marshes on the 600 foot River Walk is wonderful; the Navigators’ Planetarium with demonstrations of how early European explorers navigated by the stars creates an awareness of the challenges of 16th century sea travel. The huge globe is super cool; the Minorcan Village gives an interesting glimpse into life in the settlement. Archaeological digs, which began on the site in 1934 are on-going, are interesting to watch, and being able to dig a bit is super fun! In a town dating back 450 years, rich with historic sites to visit, this serenely beautiful site is a place just to be. Make the time to experience it. It’s a small chapel built in 1915 on lovely grounds on the Matanzas River. It was here that Menendez knelt to kiss the wood cross presented to him by Father Francisco Lopez, the expedition chaplain, upon their arrival in 1565. It was on this site that Fr. Lopez celebrated the first parish mass; it was here, in the early 1600s, that the first shrine to the Virgin Mary in America was established. The original chapel and several later reconstructions were damaged by storms and attacks. A later one, built in 1875, was destroyed by a hurricane; the present-day chapel was built in 1915 and enshrines a replica of the original statue of Nuestra Señora de la Leche y Buen Parto. Historically speaking, it was the site where western culture and Christian faith first took root, the place John F. Kennedy once called the “holiest church in the US.” The dramatic 208 foot stainless steel Great Cross stands high above the natural beauty of the marshes and the Mantanzas River as a sentinel over the Mission. This comprehensive, immersive and interesting life-size re-creation of St. Augustine as it would have been in the various colonial eras which shaped St. Augustine. Self-guided tours are an immersive experience back in to to life as it was during the different eras. In each, re-enactors take part in the business of the day, beginning in 16th century St. Augustine as it was – a fledgling port and 1st European waterfront community. A 50 foot replica of a 16th century sailing vessel gives visitors a sense of the challenges faced by the original explorers. Another area replicates life in 17th century St. Augustine – a fledgling Spanish port town bustling with trade, craftsmen, military and missionaries. While touring this area, visitors can enjoy a meal of Spanish-flavored fare and drink in an early 18th century tavern, Taberna del Caballo. Life in the 18th century Spanish garrison town changed dramatically when the British occupied it during the American Revolution. This cultural transition is seen in a tour of the 1740s restored home, the DeMesa-Sanchez House , the Gazette Print Shoppe where there’s a re-creation of a 1770s printing press and a stop at the very British Bull and Crown Publick House for food and lively fun. Known as the Gonzalez-Alvarez House, it is the oldest surviving Spanish Colonial dwelling in Florida. Attention to historical accuracy and detail is evident in the guided tour of the small coquina house. 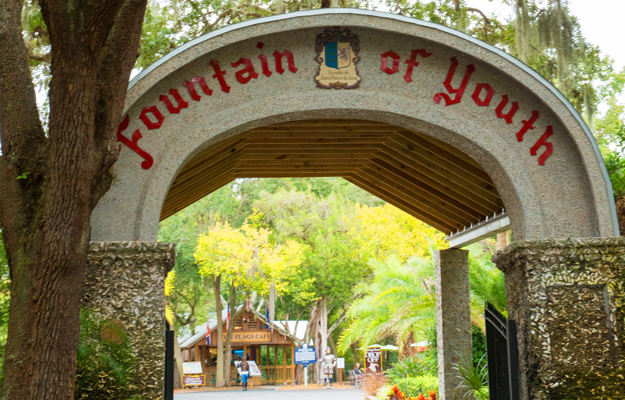 The ½ hour tour makes sense of the often confusing history of St. Augustine as it unfolds chronologically through stories of the people who lived there. The gardens are lovely; the Colonial Kitchen outbuilding replica is interesting, as are the exhibits in the small museum which has artifacts covering all eras of the St. Augustine – from exploration to the Florida land boom and the changes brought about by the railroad at the turn of the 20th century. It’s hard to believe that this diminutive, over 200 year-old red cedar and cypress house was both home to the schoolmaster and his family and a school. When the bell first rang in 1788, the family lived upstairs; the small classroom was on the ground floor. 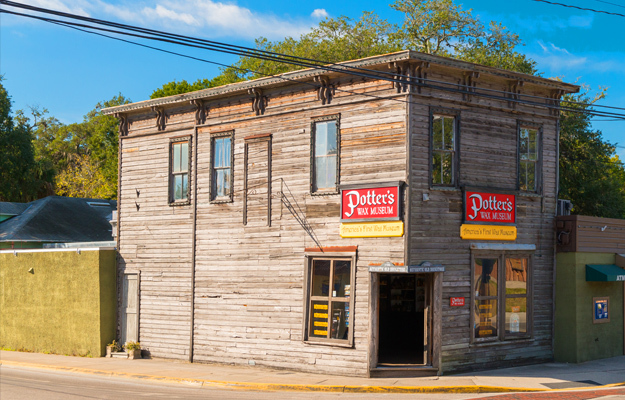 Although tiny house makes for a tiny tour, this St. Augustine landmark is charming and is for good reason the most photographed site in St. Augustine. Outside, visitors can tour the garden shaded by a 250 year old pecan tree. Inside, there’s an animated model of the schoolmaster, copies of old text books to read and 18th century school supplies. A costumed interpreter adds to the ambiance and offers a wealth of information. Built of coquina stone in 1789 as the home of merchant Andres Ximenez, it became a fashionable boarding house for women in 1830 when St. Augustine’s beautiful weather first began attracting tourists. The historic museum has been carefully restored and is thought to be the most authentic 18th century building in town. Each room in the house has its own story, told by tour guides who make the experience interesting, visual and entertaining. An interesting side note: the house has been owned and managed by women since 1830! A military hospital complex in the 2nd Spanish Period (1784-1821), it was a 3-part facility encompassing hospital buildings from both the 1st Spanish and British periods. Fire destroyed several of the buildings, but the Watson House, an apothecary shop during the British Period, still stands today. This unusual and fascinating museum, is a favorite because of its uniqueness. Housed in a carefully researched reconstruction of what was known as Hospital East, and built on the original foundation, the museum includes interesting exhibits of surgical instruments, surgical demonstrations, explanations of apothecary medicines and colonial herbal medicines as well as the ways in which Spanish surgeons combined medical knowledge from Europe and Africa. 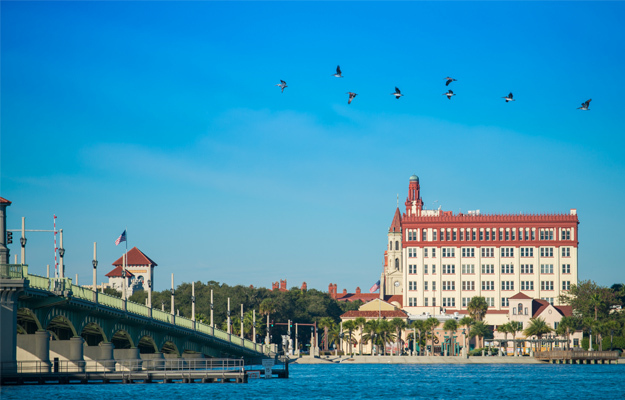 Become immersed in the opulence of the Gilded Age in the museum housed in what was once the Alcazar Hotel, built by Henry Flagler in 1888 as one of his three lavish St. Augustine resorts. Its over-the-top architectural grandness, including the world’s largest indoor swimming pool (now the location of Museum’s restaurant open daily for lunch – and fully drained of course), grand ballroom and loggias are just the beginning. Four floors of museum exhibit space house the best collection of fine and decorative 19th century art in the country. Art, antiques, glass, eclectic curios give a close-up view of the super wealthy in the late 1800s and early 1900s. A favorite is the Music Room, filled with instruments from the 1870s to the 1920s, it’s where demonstrations are held at 11 am and 2pm daily. Breathtakingly beautiful inside, the 1883 winter residence of Franklin Smith is 1/10th of the scale of Alhambra Palace in Granada, Spain. It was this house that set the precedent for the popularity of Moorish Spanish Revival architecture during the Flagler resort era. In 1904 it was purchased by Abraham Mussallem, a collector fine art and Egyptian antiquities. Adding to the fabulous interior are the museum’s holdings of priceless collections of both owners: fabulous antiques, priceless art, exquisite curios and unique antiquities of both owners, each of whom had an eye for the eccentric. Some of the pieces are mind-boggling! A National Register Historic Site, it is open daily for guided and audio tours. 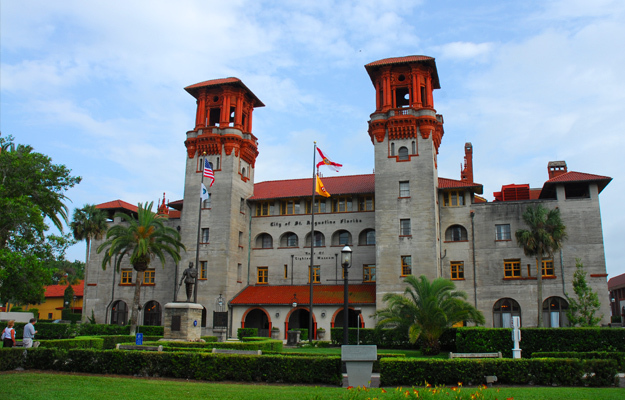 A Spanish Renaissance architectural gem, another former resort hotel built by Henry Flagler in 1888, is now the campus of Flagler College. It’s difficult to believe that students actually go to class here. Watching them make their way throughout this grand place – through manicured grounds, across the Rotunda, past the Solarium and the grand staircase – surrounded by fine furnishings, decorative arts, paintings, is an interesting contrast. The most remarkable area is the Dining Hall, lined with 79 Louis Comfort Tiffany windows and hand-painted murals on walls and ceilings! Visitors can explore some areas on their own, however, taking a tour with a student guide is the best way to really see this magnificent Gilded Age landmark. Walking through the cells, unchanged since it was a real jail from 1891 until 1953, is really creepy. Once past the creep factor, this glimpse into the penal system and daily life of prisoners is a fascinating and unique experience. Tours led by guides in period dress are filled with stories of inmates who once were imprisoned inside. 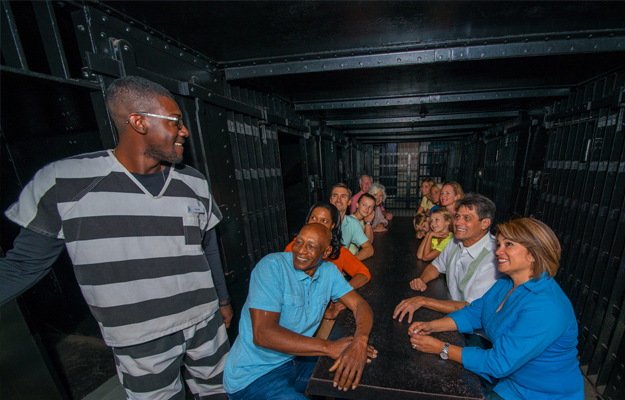 Visitors can experience jailhouse life, both from an inmate’s perspective and from the Sheriff’s perspective who lived with his family in quarters next to the cells! Daytime visits are one thing; a visit at night, possible only on a Ghosts & Gravestones tour, is something else! There’s a lot going on in this small, cool place. It’s all about pirates in the lawless 18th century seafaring age who pillared and plundered their way up and down the East coast and the Caribbean. While there’s a lot of interactive fun, there is equal attention to authenticity. A collection of authentic pirate artifacts is fascinating, as are silver bars, artifacts from real wrecks, and an amazing collection of coins. In addition to the exhibits, well-executed hands-on experiences bring pirate lore to life. Sit on a brig and hear and feel the fear as Blackbeard boards; “fire” a canon electronically; find hidden treasures; go on scavenger hunts. It’s lots of fun and super interesting. The presence of lighthouses in St. Augustine all began with the Spanish wood watchtower built in the late 1500, which evolved into a light in a coquina structure in 1824, and later to this distinctive brick black and white lighthouse which became lit in 1874. St. Augustine’s oldest surviving brick structure has been beautifully maintained, as is the Keeper’s house which is now a museum with historical artifacts and photos. It’s a workout and a thrill to climb 210 steps to the top of the lighthouse, 165 feet above sea level. The 360° view up and down the coast, over the marshes, out to sea with St. Augustine laid out in the distance is phenomenal. To get into the first wax museum in America, you have to walk through an old apothecary shop, the “Oldest Drug Store!” Then, step into a world filled with history-makers, British royals, authors, scientists, Star Wars characters, horror and A-listers! Life-size wax ones! Walk through them, get up close to them, take selfies and family photos with them. Short fact sheets about each figure gives good background information on the not-so-familiar luminaries, being able to watch artists creating them, and a super friendly and informative staff all work together to create a fun family experience. Not a museum and a short drive north of downtown St. Augustine is a 40 acre park which was the location of the first free community of former slaves. Founded in 1738, more than a century before the Emancipation Proclamation, slaves from the British colonies who were able, headed south to the Spanish colony of Florida. There, if they declared their allegiance to the King of Spain and joined the Catholic Church, they were given their freedom and lived in a community within Real de Santa Teresa de Mose,or Fort Mose, the northern defense of St. Augustine. While no evidence of earth and wooden structures remain, the small interactive museum in the mature and historic park tells the story of the first legally sanctioned free African settlement in what would become the US.